Posted: Tuesday, May 12, 2015. 7:50 pm CST. Tuesday, May 12th, 2015. Aaron Humes Reporting: Two men from Ladyville area appeared before Chief Magistrate Ann-Marie Smith on charges of attempted robbery. 28 year old Roger Hilton is also accused of wounding and assault while 32 year old Steve Arnold was charged with common assault. Ian Holland reported to police that on May 10 around 7:15 p.m. he was standing in front of Brothers Store when the two men approached him and asked for money. He refused and both of them punched him in the face. According to Holland, Hilton then assaulted him with an orange-handled scissors, stabbing him in the chest. They fled when a police vehicle approached but police set chase and apprehended both men, recovering the scissors Hilton allegedly used in the assault. 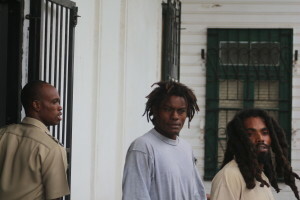 In court the Chief Magistrate upheld objections to bail on the ground of a strong case and prior criminal nature of Arnold in particular, whose rap sheet is long. The two return to court on July 10.